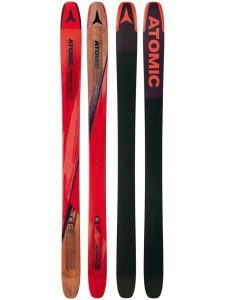 Powder skiing requires a lot of factors to consider when shopping for the perfect set of skis. You’ll want to float, bust through crud, and carve all while remaining stable at high speeds. Powder skis make surfing through the deep, soft stuff a breeze. We covered all the metrics you should consider when looking to purchase your set of skis. You’ll find everything from versatility, floatation, stability, agility, playfulness, carving, and crud-busting here on this list. Before you purchase your boards, be sure you have narrowed down how you’d most like to use your skis. Once you decide how you will be using your skis, you can utilize that as a starting point and choose the best option within that range. We took a look at some of the industry’s best powder skis for men and here are our 5 Top Picks. The Backland FR 109 is a nimble, yet light powder ski. It includes a HRZN Tech rocker on the shovel and added carbon stringers for extra stability. It is very responsive when skiing on piste due to the narrow waist and extended camber underfoot. The FR 109 can execute alpine turns as easily as it can float on soft powder. It features step-down ABS sidewalls and a blended wood core that makes it reliable on mixed snow surfaces and super playful on soft snow. These skis can handle big drops but is also quick and slick through some of the tightest lines. It is equipped with a rockered tip and tail that makes floating easy in deep, soft snow. The FR 109 has a quick turn radius as well, yet it can get shaky at high speeds when driving through bumps or gripping in on hard crusts. While skiing on-piste, the 109 is capable of bringing around medium-to-tight radius turns without demanding much of the rider. This ski is pretty nimble but larger, more aggressive riders might find the agile turn shape to be a bit unpredictable when linking turns on hard packed snow at speed. However, this ski is very agile through tracked out or bumped up crud. The FR 109 is a great choice for free ride powder skiing, so it favors pop and agility over speed and stability. Turns are super smooth, and they always rise to the top after bottoming out in fluffy snow. They are very responsive in powder and deep snow. 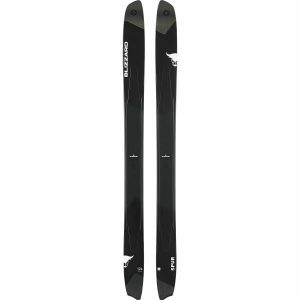 Overall, the FR 109s are an all-around great ski option. The only downside is they lack a bit of high-speed stability and shock absorption. However, the floatation is far superior to other skis on the market, making it a pretty versatile ski. The Volkl Confession is a great board for big mountain rides. It handles chop really well and also has a nice float. This board is built to charge on challenging terrain, making it a popular pro choice option. The Confession is equipped with titanal bands, a vertical sidewall, camber underfoot, and a slight front rocker. This allows the platform to remain stable when hard-charging in deep snow. This board knocks out aggressive turns like a champ. It has a multi-layer woodcore, reinforced with carbon stringers. This also makes it able to absorb shock from massive impacts. One of the strongest qualities of the Confession is its top-end stability. It has a core of poplar, ash, carbon, and titanal giving the ski a stiff but progressive flex. The rigidness of the carbon stringers also reduces vibrational deflections and dampens chatter. Though not as quick edge-to-edge as lighter skis with a narrower width, the Confession is still an aggressive carver compared to other skis with its width. It will definitely lock in and hold you into the carve. This ski handles crud really well due to its high level of dampness. Torsional rigidity keeps your edge locked in, even during short radius turns through bumpy snow. Even though the Confession has a high level of stability, it has less float and playfulness than some other options on the market. It will stay atop creamy snow, but might be a little heavy to swing on low-angle and tight terrain. It performs better when pushed fast through deep snow. The Soul 7 HD ski is remarkably easy to drive both on and off piste. It is a very dependable option for all-mountain performance. This ski is designed with the Airtip 2.0, reinforced with a Vibration Absorption System that keeps tip vibrations to a minimal. The tip is fully integrated into the core of the ski, providing more consistent flex from tip to tail. To alleviate top-end chatter at high speeds on hardpack, the Soul 7 comes with carbon weave to their wood core. This makes for a light and poppy ride, and the ski is very responsive and versatile. Top-end stability is a primary strength for the Soul 7. This board is loaded with high-definition energy, mobility, and strength. You can drive these skis fast with power and security down the fall line. It is calm at high-speeds due to its balance of stiffeness and dampness. It is a very nimble ski, but not quite as sturdy as some other options on the market. The Soul 7 is built to go fast and performs well on edge. It is a very narrow ski, making it quick to roll over and intiate turns, even through bumps, crust, and ice. This ski handles variables conditions a bit better than it does powder, though it is still fully capable of floating on deep snow. The Soul 7 has great all-around performance, making a great choice for someone who wants to ski in a variety of terrains. It is stiff and directional, making it a little less playful than other skis. However, it offers high reliability and user-friendly turns. 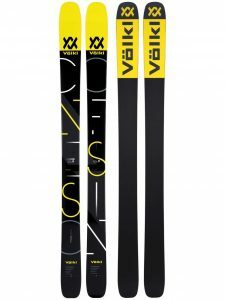 It will remain stable for cliff drops and ridge transfers, even if it has less pop than traditionally playful skis. 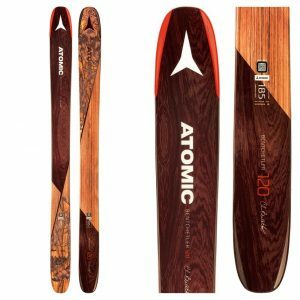 The Atomic Backland Bent Chetler has a blended rocker profile, giving you solid footing for surfy floatation, while full-length carbon stringers add both pop and stability. This is an extremely playful ski. Equipped with traditional ABS sidewalls fused into a lateral rocker in tip and tail. This gives the Chetler a buttery-yet-resilient edge for better tracking and less deflection. It is a great choice for tricks and freerides. Usually, skis with high playfulness have speed limitations in variable snow. The Chetler performs surprisingly well in said conditions. Blended core materials of durable poplar and a carbon backbone help with shock absorption while also remaining steady through high-speed vibrations. This ski is designed to be fun, but not necessarily fast. Staying centered when traveling at speed may be a bit challenging for some riders. The may be less noticeable with the 192 cm option, due to the more effective edge and added weight. Overall, this is a lively ski that can go fast when it really needs to. The Chetler isn’t the best choice for on-piste carving, which isn’t surprising for such a playful board. It has a moderate turn radius and step-down sidewall construction, making it perfectly capable of holding a decent edge on groomed snow. However, the rockered tips and tails are slow to engage on hard surfaces. This ski utilizes HRZN Tech construction that provides rocker from edge-to-edge as well as tip-to-tail. 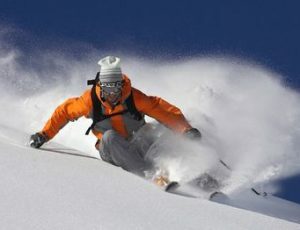 This rocker profile tracks the tips over a variety of snow types without getting deflected, in addition to playfulness. However, it does lack the force necessary to crush heavy chop. The Blizzard Spur is great for powder due to it’s large dimensions and flat-cambered rocker profile. It features a sidecut that allows carving and smooth turns in powder. It has a large turn radius that pairs well with aggressive skiers. Despite being heavy, it is a very responsive and predictable ski. The Spur is designed to replicate the feel of surfing. It is a great option for deep snow on high-angle terrain and skiers who enjoy huge turns with a little extra weight underfoot. The Spur is a bit hard to maneuver at slower speeds and on harder snow, as it was designed specifically for deep snow. It is stiff, heavy, and damp which allows it to perform really well at high-speeds, offering plenty of stability. It utilizes carbon, titanium, and a multi-layer woodcore to provide steadiness when driven at speed. The tapered tip and tail are better suited for sliding out of turns rather than deep carving. These skis are slow to initiate and don’t pack much power. However, once engaged , the Spur offers a very reliable edge hold. The Spur does really well on crud and bumped-out snow. The broad surface area and heavy construction have great plowing strength, while the flat-rockered Flipcore will coast over almost anything. It will break through heavy crust, as well as pivot through bumps. This isn’t the best option if you are looking for an extremely playful ski. The Spur was made to keep in contact with the snow, not so much for stunting. However, it serves well as a high-speed floatation device. There are several things to consider when looking at powder skis. The most important metrics are: stability at speed, carving, crud-busting ability, float, playfulness, and versatility. When looking at these factors, always keep in mind what you are planning to use your skis for the most. Knowing how you want to use you skis will help you to determine which metrics should be prioritized over others. This will help you narrow down a ski type. From there, you can go on to choosing the right brand for you. A ski’s stability is often defined by its ability to remain firmly planted on the snow surface without chattering or tossing about in variable snow. Stability is extremely important when driving at high speeds, as reactive forces from snow to ski are amplified the faster you go. High-speed stability offers the skier a steady and secure platform to ride on. Powder-specific skis usually don’t remain as stable on firm snow as other ski types. However, you still want to be sure they provide a smooth ride and can dampen bumps. 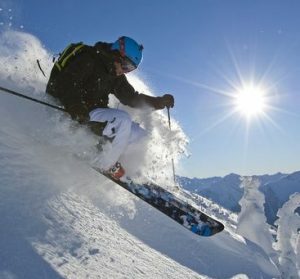 On the flip side, stiffer skis have greater stability at speed but this can sometimes compromise floatation and rebound. Aim to find the best balance between stiffness and dampness, as well as rocker and camber, as these are the most important factors regarding stability. Extra weight can also provide stability when moving fast. Overall, stability can fluctuate depending on how you plan to use you skis. Boards decided for powder generally aren’t the best for carving. However, you always want to look for boards that have a bit of crossover ability not matter which niche they initially cater to. If a ski isn’t designed for carving, it will turn over slower than skis that are specifically designed to slash. Rockered tips bring the contact point closer to the boot center and allow for quicker, easier turn initiations. 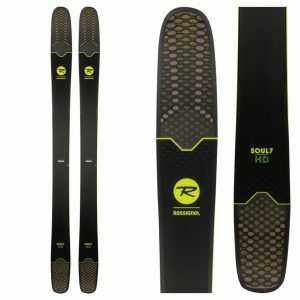 Rockered designs also provide greater utility to all-mountain skiers by enabling them to use longer, more stable skis that are still maneuvered with ease on firm snow. A ski that carves well is one with consistent edge pressure, all while achieving the smallest possible turn radius. You want your skis to be able to blast through choppy snow without getting caught or mangled. A good powder ski can manage well in variable snow. This metric should be considered a bit more important than carving capabilities. Fatter shapes and rockered construction permit a skier to cruise over variable snow without much kickback. Lighter boards, with more flex, tend to get bounced around when not in deep snow. Stiffer models tend to break through crud with the most ease, especially at high speeds. 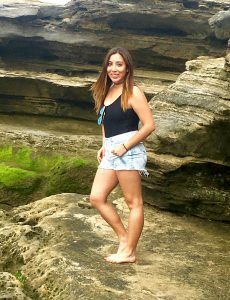 Softer models are generally more playful, but don’t have the grit necessary to handle icy crud. You definitely want to make sure you board can handle plowing through the rough stuff, even if that is not its main metric design. Float is an extremely important metric to consider. You want your powder ski to be able to float with ease in deep snow. The fatter the dimensions, the better the ski’s ability to float on top of soft snow. You also want to make sure that the skis can execute turns well in fluff, not simply float well. If the boards don’t want to turn in soft, deep snow, you will end up burning out your legs. A playful ski is very energetic and easy to engage. Overall, it is more responsive than skis designed for other metrics. Speed, terrain, and the skier type will all have a different impact on the playfulness of a specific ski type. Freeriders will place much more emphasis on playfulness than other types of skiers. If you want to stunt it out, be sure to go for skis that are agile with plenty of pop. Be sure that the landing response is balanced by high shock absorbency. Overall, you should aim for a pair of skis that offers high versatility. Ideally, you’ll want to be able to utilize your board in any terrain type or snow condition. You don’t want to have a board that can do one thing really well, but leave you hanging when caught in other situations. Floatation, stability, and crud-busting are far more important metrics to consider over playfulness and carving. This isn’t to say you should opt for a ski that can’t stunt or slash. Just make sure it has high ratings on the first three metrics before looking into the latter two. Unless, flips and jumps are your main purpose for skiing. There are plenty of options to choose from. Just remember, you can’t go wrong with a well balanced board.